1. Paint Essie polish in Skinny Dip over the entire nail. Using Licorice, create a small black half-moon shape with lines coming out from the bottom of the nail. 2. Finish by adding horizontal lines to create a web design. Try this looking using brighter shades for a more colorful look. 1. 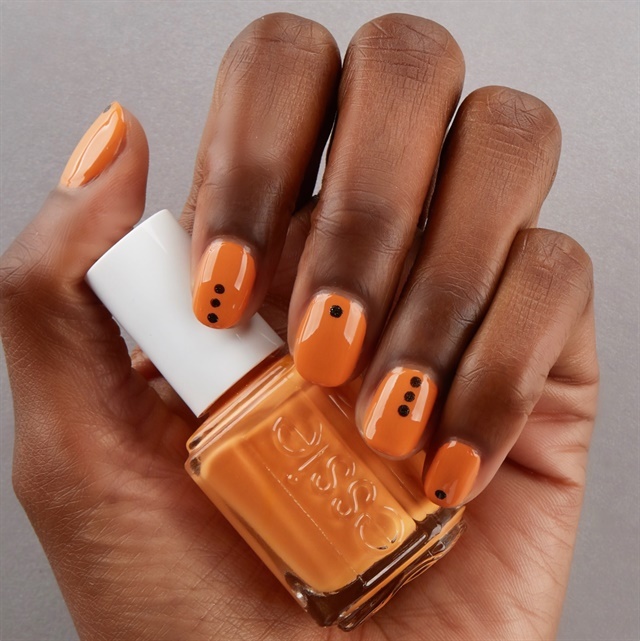 Paint the entire nail using Essie's fall 2018 shade Fall for NYC. 2. Create random dot designs on each nail using a dotting tool and the shade Tribal Textiles. 1. Use Essie's fall 2018 shade Say It Ain't Soho to paint the entire nail. 2. Create a black half-moon design over half the copper using Licorice.